Chemical communication leading to synchronization and collective behaviour of dynamic elements, such as cell colonies, is a widespread phenomenon with biological, physical and chemical importance. Such synchronization between elements proceeds via chemical communication by emmision, interdiffusion and reception of specific messenger molecules. On a lab scale, these phenomena can be modeled by encapsulating an oscillating chemical reaction, which serves as a signal (information) sender/receiver element, inside microcompartments such as droplet emulsions, liposomes and polymersomes. Droplets can thus be regarded as single units, able to generate chemical messengers that diffuse in the environment and hence can interact with other compartments. The Belousov–Zhabotinsky (BZ) reaction is a well-known chemical oscillator largely used as a model for complex nonlinear phenomena, including chemical, physical and biological examples. 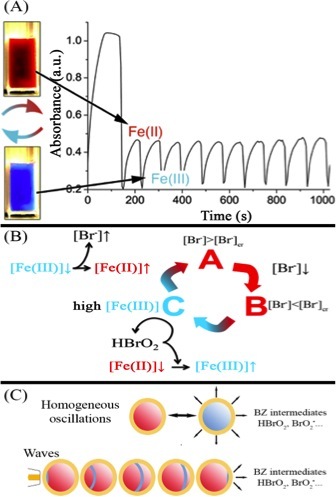 When the BZ-reaction is encapsulated inside microcompartments, its chemical intermediates can serve as messengers by diffusing among different microcompartments, to trigger specific reactions leading to a collective behavior between the elements. The geometry and constitution of the diffusion pathways play an important role in governing the collective behaviour of the system. In this context, microfluidics is not only a versatile tool for mastering the encapsulation process of the BZ-reaction in monodisperse microcompartments but also for creating geometries and networks with well defined boundaries. The individual compartments can be engineered with selected properties using different surfactants in the case of simple emulsions, or with specific membrane properties in the case of liposomes. Furthermore, it enables the arrangement of these microcompartments in various geometric configurations, where the diffusive coupling pathways between individual compartments are both spatially and chemically well-defined. In this tutorial paper, we review a number of articles reporting various approaches to generate networks of compartmentalized Belousov–Zhabotinsky (BZ) chemical oscillators using microfluidics. In contrast to biological cellular networks, the dynamical characteristics of the BZ-reaction is well-known and, when confined in microcompartments arranged in different configurations with a pure interdiffusive coupling, these communicative microreactors can serve to mimic various types of bio-physical networks, aiding to comprehend the concept of chemical communication.